SP465R 46cm self propelled rear roller lawnmower, which gives a classic striped effect to the lawn. Fitted with a Honda GCV 135cc OHC engine and 55 litre grass collector. 5 heights of cut between 20 mm and 70 mm operated by a single lever. On the self propelled Mountfield SP465R lawnmower the Honda engine provides drive to the rear roller as well as the cutting blade, so you don't have to push the mower forward making this machine very easy to use. The fitted rear roller creates a classic striped finish and will cut right up to the edges of borders leaving you wondering how you achieved a beautiful lawn with such ease. 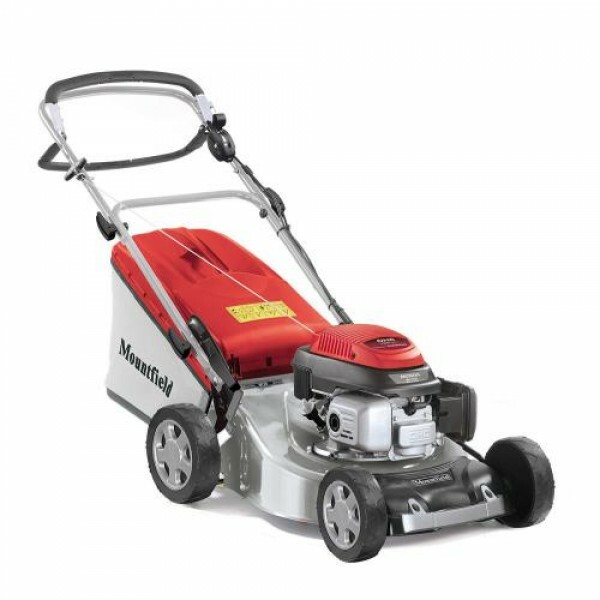 The cutting width of the Mountfield SP465R is 46cm/18" and the height of cut can be set to 5 positions between 20 mm and 70 mm using a single lever, making this a very versatile mower. Fitted with a Honda GCV 135cc OHC engine and supplied with a 55 litre grass collector which readily catches ejected clippings. Suitable for gardens up to 40m x 40m.